Background: Asthma is defined as a heterogeneous disease usually characterized by chronic airway inflammation (GINA 2016) affecting almost 334 million people worldwide (Global asthma report 2014). Treatment of asthma with a long-acting bronchodilator is important because it reduces the symptoms that occur at night or in the early morning and it is very effective to use as a long term control medication for asthma by preventing asthmatic symptoms. 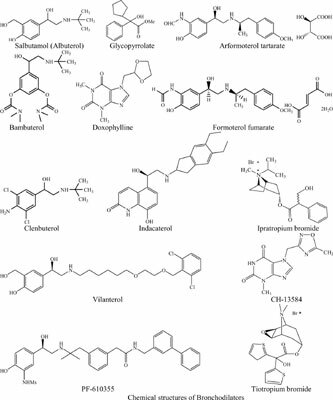 The main objective of this review is to describe the impurity profile and force degradation studies for three major classes of bronchodilators namely β2-adrenoceptor agonists, muscarinic receptor antagonists and xanthine. Unidentified and potential toxic impurities are hazardous to health, so in order to increase the safety of drug therapy; impurities should be identified and determined by selective analytical methods. Methods: Different conditions for degradations like hydrolytic (acidic, basic and neutral), oxidative, photolytic and thermolytic have been discussed in detail for bronchodilators. Furthermore, it is discussed with the name along with number of impurities and degradants present in different matrices including its clinical implication. The name as well as structures of all the observed impurities in different bronchodilators is included, which can aid in impurity profiling. Various analytical methods, including Chromatographic techniques like TLC; HPTLC; HPLC; GC, Spectroscopic techniques like UV; IR; NMR; MS and hyphenated techniques like GC-MS; LC-MS; CE-MS; SFC-MS; LC-NMR; CENMR; LC-FTIR has been used for the identification and quantification of impurities. A general scheme has been presented for the impurity profiling. Result: Nineteen articles, six patents and fifteen drugs are included in this review. In that, majority (7) of papers are based on HPLC-UV, 5 papers are based on LC-MS, 2 papers are based on LC-MS-NMR, 1 paper is based on LC-NMR, 1 paper is based on GC-MSNMR, 1 paper is based on GC-UV and 1 paper is based on TLC-UV technique for isolation and characterization of impurities. In salbutamol, 7 degradants were found by LC-MS as compare to 4 degradants by HPLC-UV. In bambuterol, 12 degradants were found by LC-MS-NMR as compare to 4 degradants by LC-MS. Conclusion: After a thorough literature search, LC-MS and LC-MS-NMR techniques are found most useful for impurity profiling. In future, LC-DAD-NMR-MS, CE-ESI-FTICR- MS can also be explored for the isolation and characterization of impurities. Keywords: Asthma, bronchodilators, impurity profiling, force degradation, chromatography, spectroscopy. Keywords:Asthma, bronchodilators, impurity profiling, force degradation, chromatography, spectroscopy. Abstract:Background: Asthma is defined as a heterogeneous disease usually characterized by chronic airway inflammation (GINA 2016) affecting almost 334 million people worldwide (Global asthma report 2014). Treatment of asthma with a long-acting bronchodilator is important because it reduces the symptoms that occur at night or in the early morning and it is very effective to use as a long term control medication for asthma by preventing asthmatic symptoms. The main objective of this review is to describe the impurity profile and force degradation studies for three major classes of bronchodilators namely β2-adrenoceptor agonists, muscarinic receptor antagonists and xanthine. Unidentified and potential toxic impurities are hazardous to health, so in order to increase the safety of drug therapy; impurities should be identified and determined by selective analytical methods.